Plans fell through, money ran short and, almost without realizing it, Amante had become one of the estimated several million college students struggling with hunger issues nationwide—including at San Jose State. The committee is an informal group of students and staff and faculty members from across campus, including Associated Students, Counseling Services, the Student Health Center, Spartan Shops, University Advancement and others. Members meet monthly to work on solutions for reducing food insecurity at SJSU. Meetings take place in the AS House and are open to all. For more information, including dates and times of meetings, please contact Tova Feldmanstern. This is not about living on dreams and Top Ramen. The USDA defines food insecurity as “consistent access to adequate food limited by a lack of money and other resources at times during the year.” It has been associated with decreased concentration and energy, depression, stress and poor health—all of which are linked to lower GPAs. Factors such as the rising cost of education and textbooks, the affordable housing crisis, increased college enrollment among students from low-income families and changing federal loan policies have brought this issue to college campuses across the country. In 2012, a Student Health Center survey of 2,260 SJSU students found that more than 30 percent sometimes or often felt hungry and did not eat because they couldn’t afford to purchase food. These results led to the formation of the SJSU Student Hunger Committee. Tova Feldmanstern, a clinical social worker in Counseling and Psychological Services, spearheads the group of students and staff and faculty members. Their goal: to find solutions for food insecurity at SJSU. “The first survey was so small,” says Stephanie Fabian, ’08 Advertising, committee member and assistant director of marketing and communications for Spartan Shops. “We wanted more data.” A second, more comprehensive survey was sent out to the entire student body via email in 2014. It confirmed what the first survey suggested. Of about 5,000 respondents, 39 percent said they had sometimes or often skipped meals while hungry because they didn’t have money for food. The committee believes the responses are representative of the campus as a whole. The 2014 Hunger in America report from Feeding America, a network of about 46,000 emergency food service agencies, estimates that roughly 10 percent of its 46.5 million adult clients are currently students. Of more than 60,000 clients surveyed, Feeding America reports that nearly one-third have had to choose between paying for food and covering educational expenses at some point in the last year. In the last decade, more than 100 on-campus food pantries have opened across the country, according to the College and University Food Bank Alliance. Led by the hunger committee, SJSU is following suit. Since launching a website with information about food resources, CalFresh benefits and educational materials, the committee has turned its attention to developing on-campus emergency food resources. 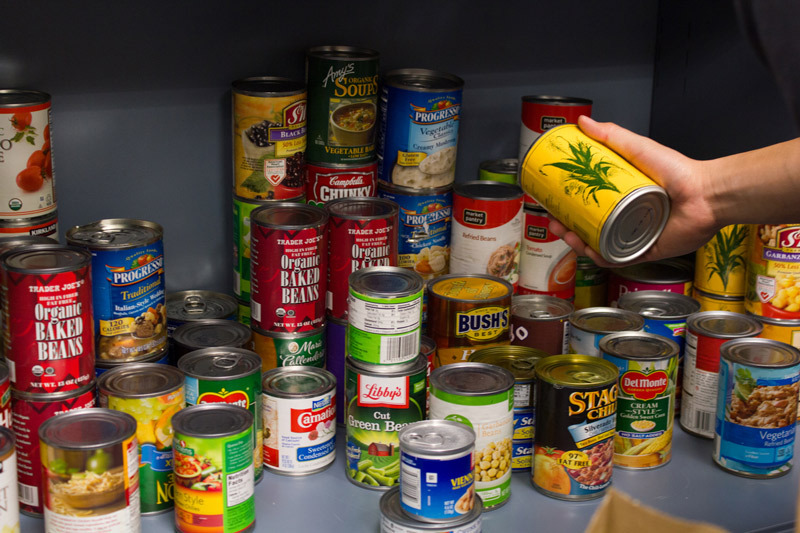 Committee members from Spartan Shops and Associated Students have been leading successful non-perishable food collection campaigns—and students are donating almost all food items. There are now more than ten food cupboards—small, informal pantries—on campus where any student can walk in and grab food, no questions asked. The committee is working with specific departments to host their own cupboards. “If a department has a bookshelf or a table, we bring a box of goods to get it going,” says Fabian. “We will restock, too, but we encourage faculty and staff members to collect food to demonstrate their support for their students.” While there is no registration process, the committee knows students are using them, as the pantries constantly require restocking. One of the committee’s goals is to garner institutional support, namely space and funding, for a campus food pantry, similar to those on many other campuses, that would offer a variety of healthy food options for students beyond what a bookshelf of non-perishables can provide. 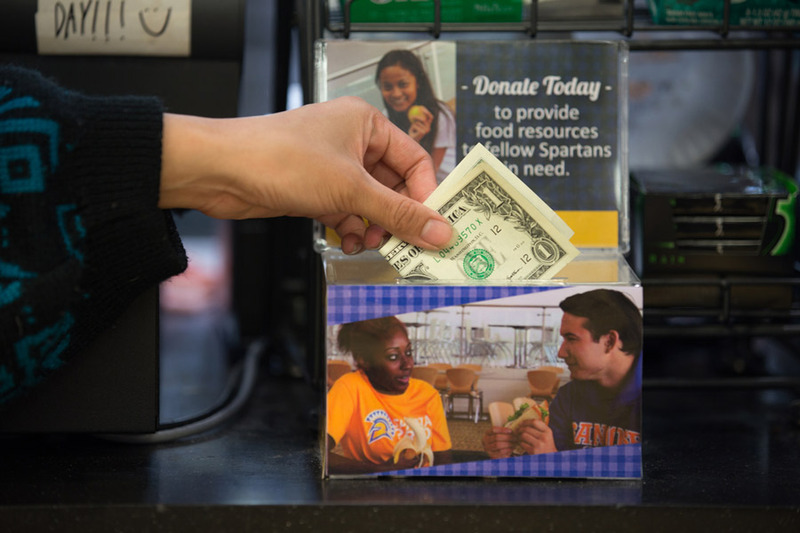 There are fundraising efforts involved as well, including change collection boxes in on-campus eateries. People are being generous, says committee member Robb Drury, associate vice president for advancement operations, who estimates that the change boxes are bringing in about $500 per month. 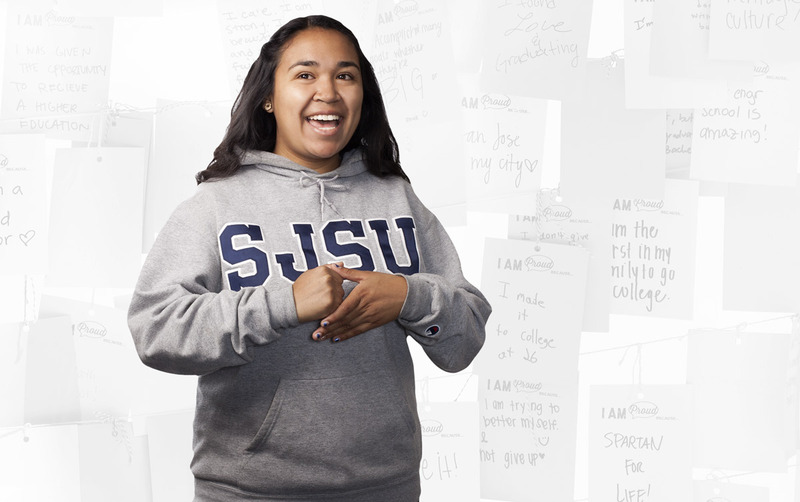 The generosity is evidenced through online donations, too—several thousand dollars worth of pledges have been made to the account through the SJSU online giving website early this year. By the spring 2014 semester, Amante was back on her feet, due in large part of the efforts of Feldmanstern, who helped identify her issues and secure CalFresh benefits. She might add ‘thriving.’ Amante maintains a 3.4 GPA, serves as AS director of external affairs and recently won the election for AS president for the 2015-16 academic year.